Film Barkhaa premiere show is over in Mumbai’s Cinemax Theater with Star cast and many celebs. Barkhaa was produced by Shabana Hashmi and Sanjay Bedia under the banner of Zahara Productions. In this film,Sara Loren and Taaha Shah have played the main cast of the film. On this premiere show many celebs came and watched the film.They included Shekhar Suman,Ranjeet,Sanjay Khan,Sunil Pal,Sanjay Bhushan,P.K.Joshi,Arun Bakshi,Lavi Rohatagi,Anjana Dobsan,Anil Sharma,Dilip Sen,Ali Asgar,Sunil Grover,Satish Koshisk,Bindu Sara Singh,Mukesh Rishi Rakhi Sawant and Keur Bedia. Film is full of romance with the twist and turns. Songs of the movie are heart touching.Indeed,the makers have kept the audience in mind while preparing the songs of the film.Sara Loren has given bold scenes in the film shot in beautiful locations across India. Sara Loren who’s playing the girl named Barkhaa in the film is the main protagonist, and the story revolves around her. 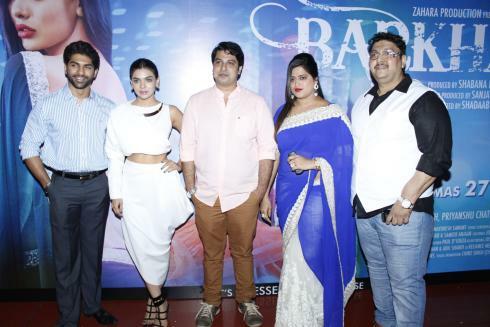 “Barkhaa is a women oriented film. Audience will get to see a story based movie after a long time in Bollywood “. The movie is being released by Essel vision productions. Main cast of the film are sara loren, taaha shah, priyanshu chatterje, sweta pandit, puneet issar and many more.